Best of all, you can even find apps to help you organise & apply your Dock skins. CandyBar comes with that functionality, but freeware DockDoctor is my personal choice for that. But the Dock skin isn’t the most important. No, the most important is what appears on your Dock (and what is hidden), how it reacts and how it’s arranged. For many months, I had "just" three main Stacks (University, Arpia Novels and Downloads). I then added a Games Stack, and finally an Uploads Stack (because I upload lots of stuff, for university & for other things). You’d be surprised how easy Stacks are to use as an application launcher. 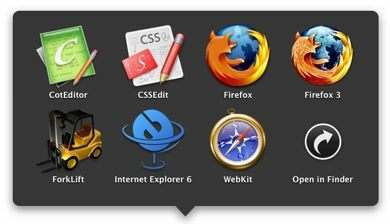 Before Leopard, Quicksilver was my application launcher: I hit "ctrl" + "space", then typed the first letters of the app’s name, and there we go. Then came Leopard, and Spotlight became my app launcher, because it was much faster than Quicksilver. And finally, I discovered how useful Stacks could be. And now, to launch Forklift (so from the first move until the application is completely open) takes me 4.4 seconds using the Stack, where it took me 5.1 seconds using Spotlight. Wooo, 0.7 seconds saved! And then, there’s the "Applications" side of the Dock. I put those I really use a lot there (Mail, Safari, iTunes, iCal, Pages) and the apps I use occasionally but still regularly (Adium, System Prefs, TextEdit, Keynote, Numbers and Photoshop). The rest is either in a Stack, or easily accessible via Spotlight. But you can see how, if it’s faster to open an app using a Stack, it’s even faster to open it if it lies on your Dock. Wallpapers are most probably the first thing the average user changes when he/she gets a new Mac. Let’s face it: the wallpapers that come with Leopard aren’t perfect, and certainly don’t match everyone’s personality. I find that InterfaceLIFT and DeviantART are among the best repositories for wallpapers. But what if you have a personal favourite, yet still want the wallpaper to change randomly every 5, 10, 30 minutes? I asked myself the question, because Aurora, Leopard’s default wallpaper, became my favourite (it’s the closest I’ve found to saying "this is for Peter" – I swear, Steve Jobs thought of me when he approved this wallpaper). The answer is simple enough: make duplicates. Little tip, but if you have over a hundred wallpapers (I know I do), having half a dozen copies of your favourite gives it a better chance of showing up. One thing I’d like to mention is that it is possible to also customise the wallpaper that appears behind the login screen (if you have automatic login disabled), and it’s even possible to make that background change randomly every time you log out/shut down. Unfortunately, I can’t remember exactly how to set it up. Here, however, is a place where you can see what I did (scroll down to the comment by "Pace", i.e. me). If you’re interested, I recommend doing a Google search for "logout hook". Well, that’s it for the Dock and wallpapers. Next volume: theming and forcing OS X to appear even more as you want it to be.